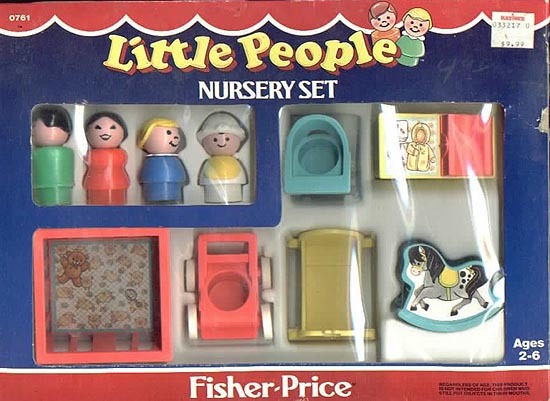 Description: 1970 introduced 3 new Little People sets that were designed as accessories for the #952 Play Family House. These sets were the #726 Patio Set, #728 Decorator Set and the #729 Kitchen Set. 1972 introduced a 4th accessory set, the #725 Bath/Utility set. 1973 introduced a 5th accessory set...the #761 Nursery. The Nursery set was the first of these accessory sets to really click, running for 16 years, and long outliving the other accessory sets. Though the baby accessories were apparently intended to be used inside the house, was there acturally even room for them? Nevertheless, this bouncing bundle of joy was a welcomed member to many Play Family Homes. The baby furniture and accessories were made in 3 different colors: turquoise, yellow, and pink. A complete set should includes all three colors. The changing table and cradle are always the same color, the high chair and rocking horse are always the same color, and the playpen and stroller are always the same color. There are a few variations among the figures sold in this set. The only hard to find figure is the light blue girl pictured in the 1981 Fisher-Price dealer catalogue. Accessories: Please remember that the following accessories are the accessories that are pictured in the Fisher-Price catalogues. These should be used as guidelines only, as other variations may exist. FPT83 - Turquoise plastic base baby changing table that has a yellow plastic "pillow" on top and a baby blanket lithograph on top of the table. Size: 2-1/2" long, 1-3/8" wide, 1-7/16" tall. FPT87 - Turquoise plastic rectangular cradle that rocks from side to side. The cradle has a heart imprint on the footboard and a diamond molded pattern "quilt" in the bed. Size: 2-3/8" long, 1-7/8" wide, and 1-1/2" tall. FPT89 - Pink high chair with 4 long legs, a "food tray" on the front, and a high rounded backrest with a half circle shaped hole in the center. Size: 1-7/16" long, 1-5/8" wide, 1-11/16" tall. FPT94 - Pink plastic rocking horse with a prancing horse paper lithograph on both sides and a safety handle across the front. Size: 2-1/4" long, 1-3/8" wide, 2" tall. FPT91 - Square yellow plastic stake-sided playpen that has a blanket lithograph in bottom with a rattle and teddy bear. Size: 2-7/8" square x 1-3/8" tall. FPT97 - Yellow plastic baby stroller with a push handle at the back. The stroller rolls on 4 small white 3/4" diameter wheels. Size: 1-7/8" long, 1-3/4" wide, 1-1/4" tall. BQWP - Green dad with black heat-stamped hair. FNWP - Blue mom with fancy eyes, and a blonde ponytail. FGWP - Blue girl with blonde braids. HKPP - White baby with a yellow bib and a bald head. FPT84 - Yellow plastic base baby changing table that has a pink plastic "pillow" on top and a baby blanket lithograph on top of the table. FPT86 - Yellow plastic rectangular cradle that rocks from side to side. The cradle has a heart imprint on the footboard and a diamond molded pattern "quilt" in the bed. Size: 2-3/8" long,1-7/8" wide, and 1-1/2" tall. FPT90 - Turquoise high chair with 4 long legs, a "food tray" on the front, and a high rounded backrest with a half circle shaped hole in the center. Size: 1-7/16" long, 1-5/8" wide, 1-11/16" tall. FPT95 - Turquoise plastic rocking horse with a prancing horse paper lithograph on both sides and a safety handle across the front. Size: 2-1/4" long, 1-3/8" wide, 2" tall. FPT92 - Square pink plastic stake-sided playpen that has a blanket lithograph in bottom with a rattle and teddy bear. Size: 2-7/8" square x 1-3/8" tall. FPT98 - Pink plastic baby stroller with a push handle at the back. The stroller rolls on 4 small white 3/4" diameter wheels. Size: 1-7/8" long, 1-3/4" wide, 1-1/4" tall. BQWP or BQPP - Green dad with black heat-stamped hair. FNWP or FNPP - Blue mom with fancy eyes, and a blonde ponytail. LAWP or LAPP - Green girl with freckles, "" eyebrows, and a brown sculpted bob. BQPP - Green dad with black heat-stamped hair. FNPP - Blue mom with fancy eyes, and a blonde ponytail. FFPP - Blue girl with a brown sculpted bob. FPT19403 - Pink plastic base baby changing table that has a turquoise plastic "pillow" on top and a baby blanket lithograph on top of the table. FPT88 - Pink plastic rectangular cradle that rocks from side to side. The cradle has a heart imprint on the footboard and a diamond molded pattern "quilt" in the bed. FPT724 - Yellow high chair with 4 long legs, a "food tray" on the front, and a high rounded backrest with a half circle shaped hole in the center. FPT96 - Yellow plastic rocking horse with a prancing horse paper lithograph on both sides and a safety handle across the front. FPT93 - Square turquoise plastic stake-sided playpen that has a blanket lithograph in bottom with a rattle and teddy bear. Size: 2-7/8" square x 1-3/8" tall. FPT99 - Turquoise plastic baby stroller with a push handle at the back. The stroller rolls on 4 small white 3/4" diameter wheels. Size: 1-7/8" long, 1-3/4" wide, 1-1/4" tall. PBPP - Light blue girl with a brown sculpted bob. CJPP - Green dad with black molded hair. GHPP - Red mom with fancy eyes, and a black ponytail. *See Variations below. FEPP - Blue girl with a blonde sculpted bob. HIPP - White baby with a yellow bib and a white bonnet. FPT85 - Orange base, turquoise "pillow". Very rare. FPT19403 - Pink base, turquoise "pillow". Rare. FPT83 - Turquoise base, yellow "pillow". FPT84 - Yellow base, pink "pillow". FPT5954 - Orange. Very rare. FPT8572 - Orange. Very rare. FPT8575 - Orange. Very rare. FPT8596 - Orange. Very rare. FPT4774 - Orange. Very rare. GFPP - The red body mom could have also had a black bun opposed to a black ponytail. FP761BOX1973 (Box ONLY) - This set was sold on a 11" x 13" display card (blister pack). FP761SET1973 - Complete set in original blister pack. FP761BOX1986 (Box ONLY) - This set was sold in a 11-13/16" long, 8-5/8" high, 2-1/8" deep display box. FP761SET1986 - Complete set in original box. FP761BOX1990 (Box ONLY) - This set was sold in a 12-7/8" long, 6-1/2" high, 5-3/8" deep box. FP761SET1990 - Complete set in original box. WFL: 07-AH-29-3-A.